Those more or less well-versed in the ins and outs of the binary option trading industry, understand and recognize auto trading scams from a mile away. Such scams have long plagued that vertical, and now they have apparently infiltrated the forex/crypto currency industry too, looking for new pastures and new suckers bedazzled by the recent rise of the crypto currency markets. Before we go any further: you need to understand that MyBitcoinBot (mybitcoinbot.com) has nothing to do with the actual crypto currency industry. It just uses the hype around Bitcoin to get potential victims hooked. It will never actually purchase and hold bitcoins for you. What it allegedly does is it trades the volatility of the crypto currency through some shady FX broker somewhere, attempting to buy low and sell high for regular profits. This theory does actually make sense. The only part MyBitcoinPro conveniently fails to mention is that no automated trader is actually capable of achieving the near-perfect profit-percentages it claims as its own, in its promotional copy. In fact, nowhere on mybitcoinbot.com is the actual trading method used by the “bot” explained or even mentioned for that matter. Here’s what everyone needs to understand about automated trading software: those who actually attempt to build such a trader, will make use of a number of technical analysis concepts and indicators. That’s it. There’s no way to include the fundamentals into automated analysis without going into high-tech territory, where million dollar investments, massive development crews and cutting-edge AI rule. That makes it obvious that the capabilities of even the most well-coded and intricate trading bots are extremely limited. That said, dime-a-dozen trading bots of MyBitcoinBot’s ilk are tossed together in a hurry and they make their “decisions” based on a couple of the simplest technical indicators out there. If you actually gained a true insight into how these things “work,” you’d burst into laughter. If you don’t have the technical prowess to actually understand how these scam bots operate, just remember this: if you have a profitable trading strategy nailed down, involving lots of repetitive moves, you might need a bot to take over from you and add volume to your trading abilities. If you aren’t profitable though and you are hoping that some magical software will earn you thousands upon thousands of dollars for $279 per year, you’re living in a dream world. Just ask yourself this: why would the creators of something capable of generating thousands of dollars per month sell it to you for $279? How can we be certain that MyBitcoinBot is indeed a scam and not a university-research-born freak of coding, into which millions of dollars in grants were sunk? That question pretty much answers itself. The MyBitcoinBot site says the software was created by a certain “Brad Sheridon.” That’s it. That’s all we are given in this regard. This purported Brad Sheridon does not exist though. It’s just a flimsy attempt on the part of the scammers to put a name on their effort, as marketing studies probably show would-be victims respond better to far-fetched, too-good-to-be-true pitches if they can associate them with an actual person. The whole MyBitcoinBot site is a classic example of scam copy too, filled with preposterous claims, false facts and ludicrous assumptions. Let us start with the beginning. What exactly does the site offer/promise? That you can make “boatloads of money” with little investment, trading Bitcoin’s volatility. If that’s not a classic “too-good-to-be-true” pitch, nothing is. The copy-writer then proceeds to bedazzle us with various facts about Bitcoin, in the vein of classic bitcoin scam pitches pushed by every scammer since the advent of digital currency. Yes. Bitcoin has seen unprecedented growth and adoption. That has nothing to do though with what this “bot” is promising you. It’s just fancy chatter designed to make you “want a piece of the action,” and induce urgency by showing you how everyone else is profiting. Don’t fall for it. The site then proceeds to tell us how we haven’t missed the boat yet, even though actually buying bitcoins and holding them is no longer an option – according to them. The reasoning they offer in this regard is downright hilarious. First of all, they tell us that getting just 1 bitcoin will do nothing at all…why not though? If someone who made a $100 investment in 2010 has $75 million worth of bitcoins now, a $2,800 investment now could theoretically generate a similar yield by 2024. Who is to say that won’t happen? It might. By then, bitcoin exchange rates would be expressed in Satoshis and an actual BTC could be worth a fortune…There’s nothing to say that cannot happen. Of course, it also may NOT happen. Who is “everyone” here and how exactly is someone’s exact “share” of Bitcoin defined? Why would someone stop acquiring BTCs after he/she has reached this mythological “share”? Why would the demand go DOWN, and why, pray tell would the supply INCREASE? A total of about 21 million BTCs will ever be mined. That’s it. The supply is limited. More than 16 million have been mined already, of which some millions have been irrevocably lost. The mining algorithm will continue to increase in difficulty, so it is estimated that it might take a century before the last BTC is mined. By then, by all logical estimates – provided the currency survives and sees larger adoption – a Satoshi will be worth much more than a BTC now. If BTC survives, it is guaranteed to increase in value, quite radically too. This is simple math. With such statements made, it’s understandable why the MyBitcoinBot site doesn’t have a proper “About Us” section. Who would want their name associated with such nonsense? Also, who would want to be publicly associated with the scam that this “product” most definitely is? Our research indicates that the My Bitcoin Bot fraud is mainly targeting people in USA and Germany as well as other countries. Their Alexa global rank is around 1.5M at the time of writing, which means they are getting a significant amount of visitors. Verdit: MyBitcoinBot is a SCAM! If you have been scammed by MyBitcoinBot, please share your story with us by replying to this post below. You’re also welcome to contact us if you would like to consult with us about your bitcoin investment strategy. We may also be able to help you recover lost funds in case you have been scammed. Simple technical analysis works on cryptos because it can’t be manipulated by market makers, broker, central banks, etc… See this site cointelegraph.com/news/bitcoin-ethereum-bitcoin-cash-ripple-stellar-litecoin-cardano-neo-eos-price-analysis-march-28 This analysis does work and yes it is simple and it works. This bot is just a more convenient way of having these simple methods that do work automated. Here’s why there willing to sell it. If I have this excellent system that makes 300 percent a year I turn my 100,000 into 300,000 in a year not bad. If 10.000 people pay 40 dollars a month I make 4 million dollars a month or 48 million dollars a year versus a profit of 200,000 a year. mybitcoinbot.com is 100% fraud, dont try it… you will never see any more. The admin keeps giving you stores and other ËAs to keep trying, you will lose alot of money. While he makes referral credits! 60 days refund policy is fake! Hahaha! I’d be pissed too if my scam got blown away like that! Good read! Lol the nerve of that guy above calling you a liar and actually saying this scam trades BTC. Even a 10-year old can tell this is a ripoff! Scammers are apparently getting more aggressive, hiring hit-squads to attack reviews that expose them. I know lol… I was (almost) shocked. You are a liar. I joined and it’s not even remotely what you say it is. It DOES trade Bitcoin. Try the software before making up blatant lies. 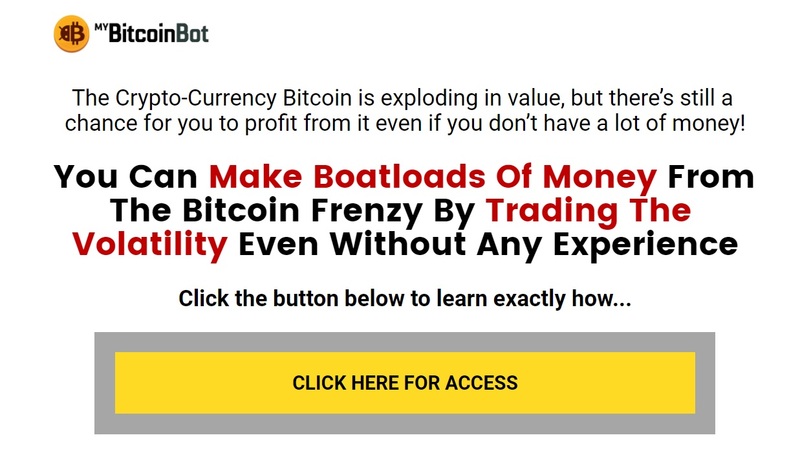 MyBitcoinBot “trades” Bitcoin via Forex brokers, and NOT via bitcoin exchanges. You’re not actually buying and selling Bitcoin. If you don’t believe us, check out the disclaimer from the MyBitcoinBot website: “Trading foreign exchange on margin carries a high level of risk, and may not be suitable for all investors. The high degree of leverage can work against you as well as for you. Before deciding to invest in foreign exchange you should carefully consider your investment objectives, level of experience, and risk appetite. The possibility exists that you could sustain a loss of some or all of your initial investment and therefore you should not invest money that you cannot afford to lose. You should be aware of all the risks associated with foreign exchange trading, and seek advice from an independent financial advisor if you have any doubts. MyBitcoinBot is a misleading SCAM! Now, if you’re in the US like your IP suggests, then you should know that MyBitcoiBot’s “trusted” brokers, such as FXChoice and AvaTrade, are not CFTC-regulated and therefore its illegal for them to solicit US persons to sign up with them. Good luck! Hopefully, you’re just a troll working for MyBitcoinBot, and not someone who actually got scammed by them. If you have, feel free to contact us for assistance. So because I’m defending them, it makes me a fool? Considering it’s doing what it says, I’ve been quite satisfied with the results. I recommend you try it first, before writing reviews. I have tried some other “systems” you have talked about and yes, a lot of them ended up being “scams” so to speak. But if you don’t test them what gives you the right to make such a claim? If you have any proof that it works, feel free to email them to us and we will change the review accordingly. Sure what do you consider proof? Broker statement? Bank statement? For starters, a screenshot of your trade history from your broker account. I guess you never really tested it, this does have a high win rate. Try it before you make statements. Why would we try an obvious scam?